Companies, organizations and even governments—particularly the United States following former President Barack Obama’s 2015 executive order to incorporate behavioral insights to better serve the American people—are turning to behavioral economics. The reason: Smartly designed and implemented behavioral interventions change the way we make decisions, alter the way organizations operate and influence how policies are implemented. But not all behavioral interventions are created and tested equally. At Carnegie Mellon University, researchers use a unique fusion of economics and psychology to tackle some of the most complicated and costly problems, ranging from rising health care costs and workplace discrimination to climate change and "fake news." “At Carnegie Mellon, we’re looking at problems that matter to the world and trying to understand the issues and why they happen but also how to change them,” said Linda Babcock, the James M. Walton Professor of Economics and head of the Department of Social and Decision Sciences in the Dietrich College of Humanities and Social Sciences. “Our brand of behavioral economics is much more mixed—about 50 percent economics and 50 percent psychology—than anywhere else. And it’s not just that we have economists and psychologists. The economists know a lot of psychology and the psychologists know a lot of economics,” Babcock said. The roots of behavioral economics started at CMU, with the late Herbert Simon, a Nobel laureate in Economics, and current faculty member George Loewenstein, a co-founder of the field. CMU behavioral economists have designed simplified health insurance plans to save people time and money. Their work has helped women learn how to negotiate. And they have created interactive tools for teenagers that have prevented sexually transmitted infections and reduced unwanted pregnancies. Technology, social media and big data are also changing the landscape, and CMU researchers — led by Loewenstein — are challenging the traditional economic accounts of how people deal with information. Saurabh Bhargava, assistant professor of economics, social and decision sciences, partnered with the IRS to redesign tax credit communication strategies that could help nearly millions of disadvantaged Americans claim billions in benefits. “Ultimately this agenda suggests that the way we structure, frame and even market policies really does make a difference. That basic insight has the potential to radically improve outcomes, especially those at the greatest social and economic risk,” Bhargava said. CMU is also leading the education of the next generation of behavioral economists. It is the only academic institution to offer an undergraduate degree in behavioral economics, policy and organizations and a Ph.D. in behavioral economics, joint with the Tepper School of Business. 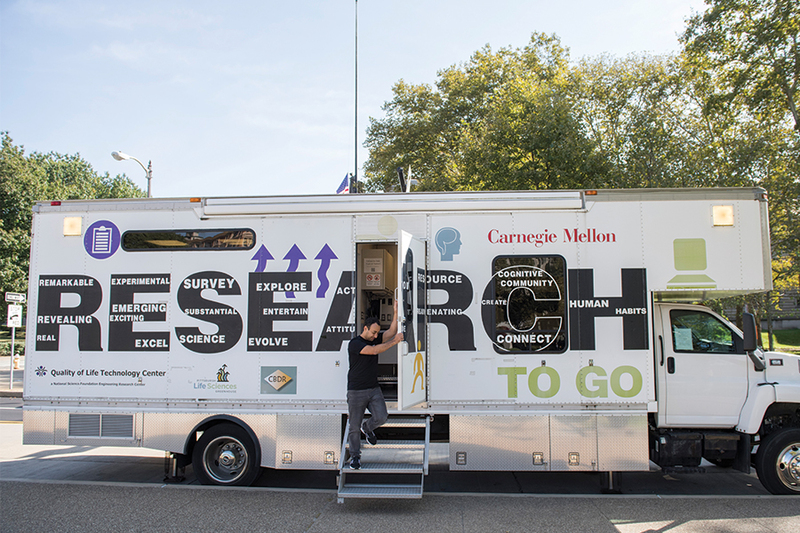 Pictured above: The Research Truck is another example of Carnegie Mellon University's distinctive approach to behavioral economics. The mobile lab allows researchers to drive into different neighborhoods and areas to get a diverse population of study participants.